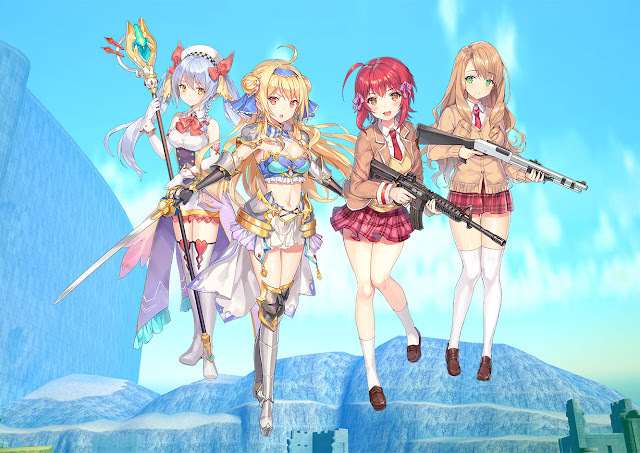 Bullet Girls Phantasia is the next super-pervy anime game that will get an English release exclusively in Asian markets. Likely because the developers assume that the game will get all kinds of heat (or outright banned) were it to go down standard publishing routes, releasing it in English in one market, and then allowing fans to import it from there, is a neat way to sidestep the issue. Because Bullet Girls Phantasia would very much end up on the censor's radar. This is a game that not features the ripping clothes mechanic of most fanservicey games these days, but takes it as far as the underwear too. Usually with these games the underwear is made of some incredible material that can withstand anything, where standard clothing tears in a light breeze. So, yes, it's pretty fanservicey. The previous Bullet Girls, on Vita, was a shooter (only instead of putting bullet holes in people and making them bleed, there you'd tear strips of clothing off them), but this one is a big shift in another direction, taking place instead in a fantasy world of orcs and things. It'll still be a firmly action-based game, but at least now it'll break away from the "CoD but with fanservice" line. Bullet Girls Phantasia releases on PlayStation 4 and Vita in English on August 9.